By Amanda Glenn Leave a Comment April 3, 2019 This post may contain affiliate links. There is nothing worse than defrosting a bag of breast milk and having the milk leak all over your fridge or sink! 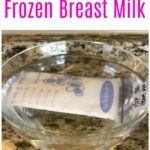 Here are three methods for defrosting breast milk WITHOUT leaks, so that no milk is wasted. There are three ways to defrost frozen breast milk – in warm water, in cold water, and in the fridge. Breast milk should never be left out at room temperature to thaw. 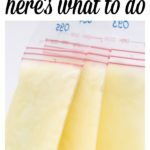 Here are the pros and cons to each method, along with how to do it without losing breast milk due to leaks in the bag! 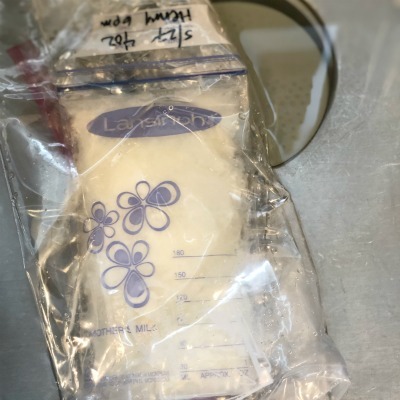 The fastest and easiest way to defrost breast milk that you plan to use immediately is to put the breast milk storage bag into warm water, as this will defrost and warm the milk at the same time. However, you should only use this method if you plan to use all of the milk in the bag – once breast milk has been warmed, it should be used within 2 hours. To do this, you can just fill the bottom of your sink or a bowl of water with warm water, throw a bag of breast milk in, and wait a few minutes. Put the bag of breast milk into a new zip-top plastic bag, and put the bag into the sink. Let it sit for a few minutes. When it’s thawed, take the bag out of the sink. (Be careful in case the water is still warm!) At this point, you should be able to tell if the breast milk bag leaked into the plastic bag. If it didn’t leak, just go ahead and pour it into a bottle you’re going to use to feed. You can use a flange as a funnel to avoid spilling while you transfer the milk. If it the breast milk bag did leak, keep the breast milk bag in the plastic bag, open it, and carefully pour the milk from the breast milk bag into the bottle, holding it so that the milk that leaked into the zip-top bag doesn’t spill out. Then, once the breast milk bag is empty, take it out of the plastic bag. Then pour the milk that leaked into the zip-top bag into the bottle. Common question – can you reuse the zip-top bags you defrost the milk in? If the breast milk storage bag leaked, you should discard it. 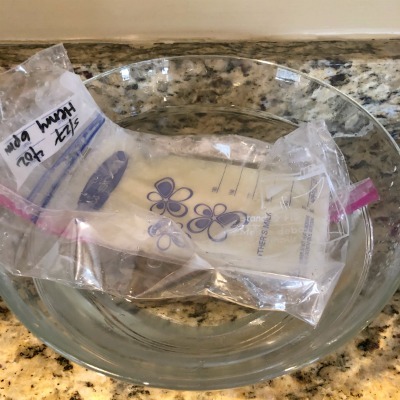 If the breast milk storage bag did not leak and you defrosted in a clean bowl (versus a sink), I think it would be fine to reuse, as it’s just a bag that got wet and had no contact with breast milk. However, reusing a plastic bag that sat in a warm sink makes me nervous because of bacteria (see CDC guidelines on sinks and pump parts) so I would probably discard zip-top bags used this way as well. After you defrost milk using the above method, it should be used within 2 hours. The next fastest way to defrost breast milk is to put the bag into cold water. 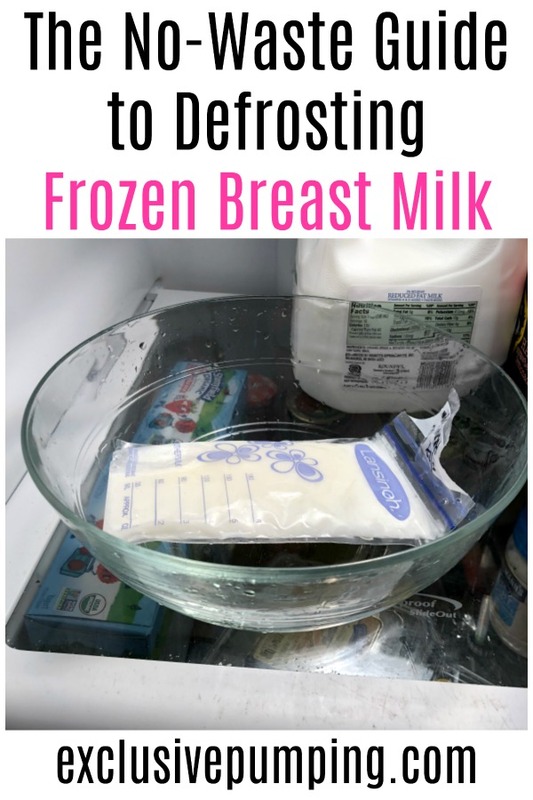 This is a good method to use when you don’t plan to use all of the milk stored in the bag immediately, or if you are preparing bottles to be used later and don’t want to wait for it to defrost in the fridge. To do this, you do the exact same thing as described above – only with COLD water instead of hot water. Once the milk has defrosted, you can put it in bottles to store in the refrigerator to be used within 24 hours, or you can warm it and feed immediately. You should use the milk within two hours after warming it. The slowest way to defrost breast milk is to put the in the refrigerator to thaw. How long it will take to thaw depends on a bunch of things (like how much milk is in the breast milk bag, the temperature of your fridge, etc. ), but generally speaking I would take it out of the freezer and put it in the fridge about 12 hours before you need it defrosted if you use this method. 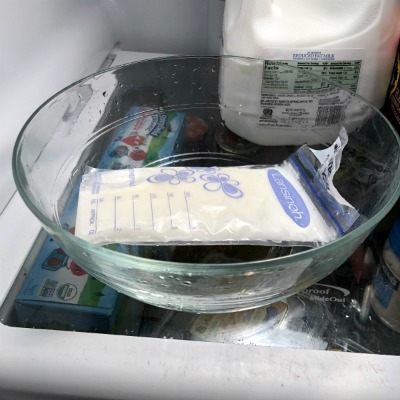 To do this, put your breast milk storage bag in a bowl, and stick it in the fridge to thaw. Cover it with plastic wrap in case of leaks (to prevent the leaked breast milk from being exposed to outside bacteria). When it’s done thawing, if the bag didn’t leak, you can pour the milk into a bottle and you’re all set. (Again, use a breast shield as a funnel to minimize spills). If the milk did leak, pour the breast milk into the bottle from the bag, and then add the milk from the bowl with the funnel. You should use milk defrosted in the refrigerator within 24 hours after it finishes thawing (meaning there are no more ice crystals), and within 2 hours after warming.